Through the years, DEI has conducted research on sea scallops, Placopecten magellanicus, in the hatchery and in the field and has also raised cultured scallops in the hatchery. DEI’s hatchery has a specially built Boreal Culture Room for the conditioning of broodstock and rearing larvae and juveniles of colder climate species. The room keeps seawater temperature below 50oF (10oC). Replaced during the 2018 expansion, the original Boreal Culture Room opened in August 2010 for a project involving juvenile wild sea scallops. Typically, Sea scallops spawn in the late summer or early fall. Sometimes it is not possible to collect well-conditioned broodstock from the wild. Therefore, DEI developed a regimen of feeding adult scallops with several species of cultured microalgae and, with decreasing and gradually increasing seawater temperatures, DEI has been successful in getting sea scallops to spawn just about any time of year. 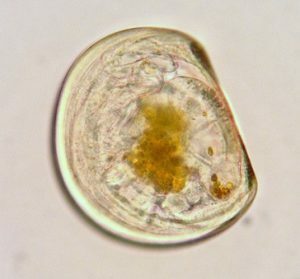 Scallop larvae typically take between 25-35 days to metamorphose and become juveniles. 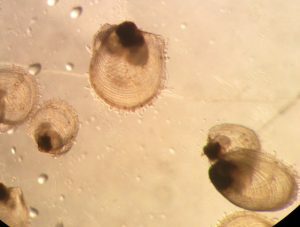 Left: a 20 day old scallop with a fully-developed larval shell and a full gut of digested cultured microalgae (photo taken on Dec. 29 by Kyle Pepperman). Right: Recently metamorphosed sea scallop juveniles. Animals are around 200 microns in shell length. Photo taken by Kyle Pepperman.